William Harris (carpenter); Elizabeth Brent (widow of Moses Brent). Thomas Gant (laborer); Francis A. Wood (coal). Susan Henson (widow of David Henson); Thomas A. Gant (laborer, boards). Elizabeth Brent (widow of Moses Brent); Susan Henson (widow of David Henson). Elizabeth Brent (widow of Moses Brent); Edward Henson (laborer); Susan Henson (widow of David Henson, washer). Richard Miller (coachman); Eliza Brent (widow of Moses Brent). Richard Miller (coachman); Rosetta Stewart; Elizabeth Lewis (widow of Lafayette Lewis). Warren Berry (laborer); Eliza Brent (widow of Moses Brent). Warren Berry (laborer); Susan Henson (widow of David Henson); Eliza Brent (widow); Annie Henson (washer). Annie Hogan; Thomas J. Godwin (clerk); Francis A. Wood (coal). F. A. Wood (Capitol Police). Annie Hogan (domestic); Francis A. Wood (coal). Thomas J. Godwin (clerk, District Commissioner). Thomas J. Godwin (clerk, District Commissioner); Francis A. Wood (coal). Mary Butler (domestic); F. A. Wood (coal and wood); Thomas J. Godwin (clerk, District Commissioner). Josephus Stephens; Francis A. Wood (coal). Joseph Stephens (mining expert); Francis A. Wood (coal). Josephus Stephens (mining expert); Francis A. Wood (coal). Elizabeth Henson (domestic); Joseph Stevens. Joseph Stephens (mining); Francis A. Wood (coal). Joseph Stephens; Frank A. Wood. Josephus Stevens; Francis A. Wood. John Stephens (mining engineer, boards); Francis A. Wood. Frances A. Wood; Josephus Stephens (mining engineer). Frances A. Wood; M. J. Stephens (agent, S-P Vaporizing Agency). Mary J. Stephens (widow of Josephus Stephens). E. H. Orndoff; Grace C. Smith. P. S. Smith (clerk, Washington Market Co.). Preston S. Smith (superintendent, Washington Market Co.). Elizabeth Bentley (widow of Thomas Bentley); Belle Ryon; Benjamin F. Ryon (clerk). Harry E. Lineaweaver (clerk, Pension Office); Prudence Lineaweaver (widow of Kline C. Lineaweaver). Henry E. Lineaweaver (clerk, Pension Office); Prudence M. Lineaweaver (widow of Kline C. Lineaweaver). Harry E. Lineaweaver (clerk, Pension Office); Prudence M. Lineaweaver (widow of Kline C. Lineaweaver); Mary B. Lineaweaver (clerk, Pension Office). Harry E. Lineaweaver (clerk, Pension Office). Harry E. Lineaweaver (private secretary); Prudence M. Lineaweaver (widow of Kline C. Lineaweaver); Mary B. Lineaweaver (clerk, Pension Office). Prudence M. Lineaweaver (widow of Kline C. Lineaweaver); Mary B. Lineaweaver (clerk, Pension Office). Mary B. Lineaweaver (clerk, Pension Office). Prudence M. Lineaweaver (widow of Kline C. Lineaweaver); Mary B. Lineaweaver (clerk, Pension Office); Elizabeth Lineaweaver. Prudence M. Lineaweaver (widow of Kline C. Lineaweaver); Mary B. Lineaweaver (Pension Office). Mary B. Lineaweaver (Pension Office); Prudence N. Lineaweaver. Elizabeth Lineaweaver; Mary B. Lineaweaver (clerk, Pension Office); Prudence M. Lineaweaver (widow of Kline C. Lineaweaver); Minnie E. Carter (bookkeeper). Mary B. Lineaweaver (Pension Office); Prudence M. Lineaweaver (widow of Kline C. Lineaweaver). Elizabeth Lineaweaver; Mary B. Lineaweaver (clerk, Pension Office); Prudence M. Lineaweaver (widow of K. C. Lineaweaver). Elizabeth Lineaweaver (boards); Mary B. Lineaweaver (clerk, Pension Office, boards); Prudence M. Lineaweaver (widow of Kline Lineaweaver). Elizabeth Lineaweaver (clerk); Mary V. Lineaweaver (clerk, Pension Office); Prudence M. Lineaweaver (widow of Kline Lineaweaver). “Real Estate Transfers.” Washington Evening Star, 29 September 1909, p. 11. Washington Post, 19 March 1907, p. 14. Washington Evening Star, 17 May 1896, p. 12. 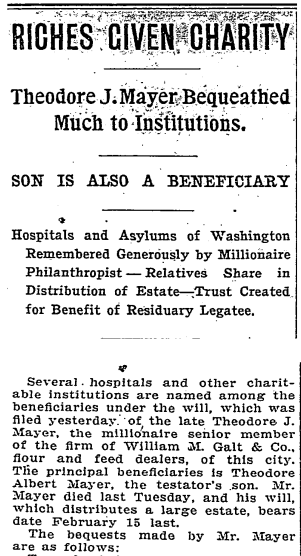 “Social and Personal.” Washington Post, 22 September 1901, p. 20. “Society.” Washington Post, 10 December 1905, p. E5.